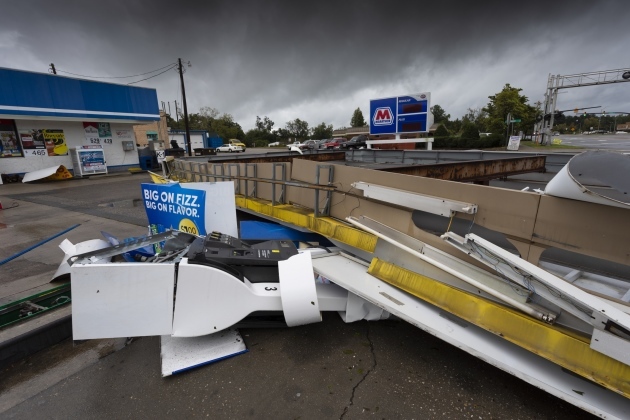 A gas station is destroyed in Raeford, North Carolina, after being hit by Hurricane Florence. Less than two weeks ago, Hurricane Florence came ashore, impacting the Carolinas and Virginia. Just when you thought the rain had ceased, the region is expecting more. This amount of rainfall is historic, coming in second among storms, with 17.5 inches of rainfall compared to Hurricane Harvey’s 25.6 inches in a 14,000-square-mile area. That’s 8 trillion gallons of rain for the Carolinas — with more on the way. Georgetown, South Carolina, for example, has been evacuated as the area is expected to flood due to multiple rivers converging. In Horry County, South Carolina, Emergency Management Director Randy Webster described the flooding situation as “unprecedented.” He stated: “We know a lot of folks are going to be impacted that have never been impacted before." That’s for sure. Over 43 people have died in this already historic storm; 36 of them were from North Carolina. Meanwhile, thousands remain in the dark without the coal-fired electricity so central to the region’s utilities market. We have not seen the end of threatening weather yet. More than 8,000 people have been evacuated in coastal regions of the Carolinas as of Sept 25, and residents and onlookers are on pins and needles watching water levels rise. The fact that the two highest rainfall amounts ever have occurred over the past two years is not lost on those who acknowledge climate change’s threat. According to the First Street Foundation, rising sea levels exacerbate the area’s rainfall damage. The National Oceanic and Atmospheric Administration has studied tide data in the Carolinas and found that the area suffers from an average rise of 6 inches in the sea level since 1970. Now for the nasty details. Before the storm hit the Carolinas, warnings were in place to watch floodwaters as they reach two distinct toxic nightmare scenarios: hog waste pits and coal ash ponds. The stormwaters delivered. Water managed to reach "cesspools containing the waste of 6 million hogs." As of last weekend, "54 lagoons have discharged their waste into the environment, another 76 are at risk of doing so, and six have some form of structural damage that may have led to the release of pig feces." There’s also the looming threat of coal ash contamination. Coal ash is what remains after coal is burned. It contains heavy metals — like lead and arsenic — that lead to serious health problems, including cancer, nervous system problems, and reproductive disorders. Water reached two coal ash basins on Cape Fear River, which may have already been subject to ash contamination. This is just one area, and there are other reports of potential ash contamination, including in South Carolina’s Waccamaw River. As we begin to wrap our minds around climate change’s massive, almost unthinkable, challenges, one thing is clear. The Carolinas’ deleterious weather events make a strong case for sustainable energy alternatives. And more people see that as the situation unfolds. Solar and wind-based electricity, while only representative of a small amount of the overall energy market, were almost immediately functional in the region after Florence hit. However, thousands dependent on the standard coal-based power option remain without power today. We saw this during Hurricane Maria as well. After the hurricane hit Puerto Rico, the case was made for more sustainable and distributed microgrid solar utilities as the island suffered under a near total blackout. If you follow the national debate on coal-burning electricity, you know that the U.S. is behind other countries, like the U.K., in the phasing out of dirty coal production. Coal’s negative environmental impacts get more complex, with coal ash threatening destruction in ways that will be difficult to detect. The long-term pie in the sky solution of phasing out coal production, oddly, starts to look like a reasonable short-term answer to replace these multi-leveled toxic scenarios. North Carolina’s coal-fired power plants already have a reputation as some of the nation’s worst polluters. Three of its power plants emit the equivalent of "eight million cars worth of pollution each year" — according to a Clean Energy Associate with Environment North Carolina. Even Duke Energy, which has plenty of messes to clean up in the flooding aftermath, has recently acknowledged solar power’s significance by making it easier to install panels in homes. Right now, out of 3.2 million Duke Energy customers, 6,000 have private solar systems. If more people turn to this alternative after experiencing power outages, they will be able to qualify for rebates from the company’s new, $62 million program. Obviously, the short-term focus here will be on returning evacuated residents to their homes while cleaning up neighborhoods and toxic contamination sites. Looming immediately in the background is the greater question of coal-fired production’s many hazards, which has been a recent focus for environmentalists protesting coal ash production in the area.